it's a patchwork sleep sack, from Anna Maria Horner's Handmade Beginnings book. I attempted a unisex look - feeling that a little bit of pink wouldn't hurt. The patchwork front is made from Tiny Tip Top fabrics and Kei Honeycomb - both Japanese import fabrics. I thought I would hate putting all of those tiny squares together but it actually wasn't that bad. The lining is a simple white on blue flannel dot from Robert Kaufman. The backing is a Erin McMorris Irving Street flannel. I made double fold bias tape from some Kona Robin's Egg. I had a really hard time putting the outer pieces together with the lining - so much so that I had to ask for my husband's help in interpreting the instructions. I ended up making a major mistake with the "under panel" - but I was able to improvise. I feel like I might have to make this again to figure out what I had done wrong. I cut the bajillion pieces to make the bag on the cover of Amy Butler's newest book. Now I have to wait till my 50% off Joann's coupon is valid so that I can get the mammoth piece of interfacing to back all of the purse pieces. Making an Amy Butler bag is a commitment, to say the least, but it is fun and the results are usually worth it. Nick had been asking me, for over three years, to make a curtain for our back window in our home. I finally did! He was surprised when he saw it. I used instructions from the book Sewing in No Time by Emma Hardy. I love that book, bytheway; I highly recommend it. Now our horrible alcoholic, screaming neighbor can't see into our house! Woohoo! I had a lot of fun making this improvisational quilt top. I used up a lot of scraps (though I had to cut up some stash fabric to add more variety to the composition) and didn't have to worry about seam allowance. It is so girly but I love it. I love the color pink and it looks great with orange and yellow. The only challenging part was squaring pieces of the quilt top - I am not very good at neatly cutting large pieces of fabric. I plan on making a pieced back with some stash fabrics and quilting it on a domestic machine. I feel a little "quilted out" right now - I just reviewed all posts from this year and counted that I have compelted 15 quilts and 2 quilt tops as of this weekend. That is a lot of quilting and a lot of binding. 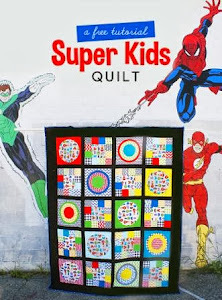 I have to explain, especially for newer readers of this blog, that I foolishly allowed MULTIPLE quilt tops to pile up for about 18 months because I didn't know how to quilt. I was even secretly critical of other bloggers who seemed to be churning out quilt tops constantly - never to complete them. Well guess what? I was one of them! I finally started learning how to quilt and I decided to complete all of my unfinished projects this year. But this week I am taking a break from all of that and I am allowing myself to do some smaller projects this week as I think about my next two big quilts I would like to make: the Material Obsession dresden one, and a mammoth Sherbet Pips conglomeration (pulled fabrics yesterday and have a big box full - waiting for inspiration). I finally feel in the mood to attempt making some bags and a few of these. Wish me luck. Here is a quilt I made for myself: Hanging it from a balcony on my parent's house was the only way to get a decent picture - I asked for help from my sister and husband to get a good shot of it. I was going to enter this into the Blogger's Quilt Festival, but I didn't finish in time. It does serve as my entry into the Naked Bed Challenge. I made the binding on Thursday night and I long-arm quilted it and bound it on Friday. I was sleeping nice and cozy under it last night. This quilt contains many fabrics from my all-time favorite fabric collection, Heather Bailey's Pop Garden. I also added 55 other prints from other favorites - including the collections Flora and Fauna, It's a Hoot, Tufted Tweets, Tip Top, Swell, Sanctuary, Summer in the City, Ta Dots, etc. All of them came from my stash except for two. Getting a good picture of this monster is not easy. It measures 100" x 109." 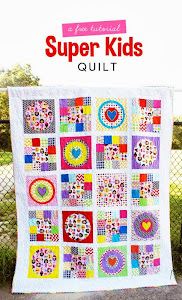 I loosely followed a pattern for this quilt but I cannot find the booklet - I will update as soon as I find it. Since I am still so new to long-arm quilting, I decided to stay with free-motion stippling to quilt this quilt. I know it would've been cute with lots of quilted flowers or something else, but I just didn't have the energy to figure that out and didn't want to mess it up by trying something totally new. The biggest hiccup I had with this quilt was that I pieced a 10 inch strip of batting to the side of the packaged queen-sized batting I had had in order to be economical and use what I had in the house. I have now learned my lesson that hand-sewing batting pieces together is not a good idea - it essentially turned the added strip into a ruffle - which was definitely NOT pretty to deal with. To add insult to injury, when I got to the end of quilting the quilt, I learned that I had oriented the batting between the quilt layers in the wrong direction and ended up having to "add batting" to the bottom of the quilt by using "batting tape" (strips of interfacing for knits). Talk about a nightmare! Anyway - I don't want to end this post on a negative note - I really like this quilt and I am very pleased with it. It is going on my bed and I love, love, love it! I love making big quilts, using fabrics I love, and long-arm quilting. I try to get my machine serviced/cleaned on an annual basis but I was recently guilty of waiting far too long to bring it in to the serviceman. Money was pretty tight in 2010 and once our budget loosened up a bit - I indulged in fabric buying rather than investing in taking care of my machine. Recently I realized that I needed to have it cleaned when friends at the retreat told me that my machine sounded like a machine gun, the lightbulb burned out, and the feed-dogs weren't working very well. Turns out that I almost did permanent damage to machine - because *shockingly* - I sew more than most people and my machine was sorely in need of some TLC. I don't think the guy who serviced the machine had seen that much lint in one machine before. Lesson learned. When my machine returned home, I started working on the project below - adding the third section (far right). It's an exercise in improvisational piecing and I am enjoying it right now. This top had been sitting for exactly one year and I hadn't been sure if I was going to finish it as is or add to it. I ran into Joann's today thinking that I might use my 60% off coupon on packaged Warm and Natural batting- only to faint in shock that the price has been raised to $35!!!! It's only 3 yards in the package - I am just amazed. I have seen cotton prices creeping up but I wonder how long it takes before some people go out of business. Newer prints at LQS' are about $12 per yard but I can still find them online for at least $8 (plus shipping - unless I can find free shipping). Raising prices stresses me out - quilting is already expensive enough! I barely finished the top! Woohoo! It was awesome completing it at my friend's house who is also a sewer. She gave me some good feedback about including a border. I hadn't been planning on doing so - but in the end, I am so in love with the "Peonies in Red" print - that of course it looks good!!! It's kind of a gray day today - so I will post better pictures soon. I am quilting it on the 20th of this month and will do the big reveal then. My husband tends to spoil me for Mother's Day. I received these fabrics from him recently - I had had the planes but was so happy to get my hands on the cars, trains, and helicopters! The collection is called Ready, Set, Go by Anne Kelle. 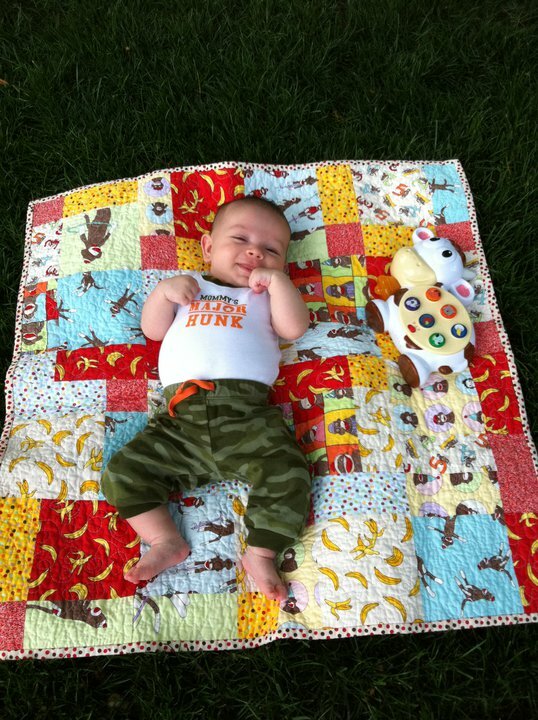 Most of you won't be surprised that my son will probably end up having at least two twin-sized quilts eventually. The options for boy fabrics just keep getting better and better. I can't wait for some of these to be available. I finally did the dreaded project of organizing my scraps - this is the "in process" picture. What a nightmare that was. That silver tub on the floor- that was stuffed full of scraps from years of sewing - I had never organized them before. I was kind of mad at myself for saving so many ridiculous pieces - I had saved the oddest, most useless cuts that ended up going in the trash. I also gave a bunch to a friend who seemed happy to have them. Now I am down to just a few shoe boxes full. I am kind of shocked that I didn't have very many usable scraps as I had believed - I don't think there is going to be any awesome scrappy quilts in my near future. But I was inspired to return to my Princess quilt and will probably use up most of my orange, pink, and yellow pieces. I caught up on my bee obligations. Meaghan had our final round for the Boston Modern Quilt Guild and she sent a bunch of gorgeous solid pieces as well as a few prints. She asked us to make an improvisational block with no wonkiness. I hope she likes it! Lynn, from Hip to Bee Square, asked for square in square log cabin blocks and she sent the fabrics precut, as well as an adorable pincushion (forgot to take a picture, but I will do so soon). I hope everyone has a great weekend. My husband is bringing Gregory on a father/son campout - so guess what I will be doing? At the retreat I managed to sew most of the red/aqua pop garden blocks: I am doing my best to promote the dumbing down of quilting by doing a pattern a child could do: rectangles within squares. My makeshift design wall can only hold about 1/4 of all of the blocks - so that kind of stinks. I am going to a friend's house, who has kindly offered to allow me to use her floor space to lay them out and she's even going to help me assemble them all together. There are 110 blocks to make a queen sized quilt. It's going to be huge and I am loving it. The biggest headache of this quilt was all of the cutting required - yuck! I hate cutting so much. And to make it even worse - I cut way too much..... Lots of pieces left over. I already have an appointment to rent the long-arm machine on May 20 - hopefully I will be sleeping under it by June. I finally got the courage to tackle the appliqueing of the hexagon mini quilt onto a rectangle of some background fabric. I literally thought about how to do this for weeks. The issue was that the basting thread and papers were not removed from the outer hexagons and I needed to remove them without losing the shape of the hexagons. I finally realized that my best friend would be spray starch. I sprayed the whole piece and ironed it - I did this three times. Then I snipped the basting stitches with a seam ripper and pulled the string and papers out. The hexagons remained so stiff that I did not even need to use pins to keep them in shape as I machine stitched the edge of the whole piece. I completed this mini quilt recently. The star is a paper-pieced block that we completed in a BMQG meeting last summer. I quilted it at the retreat. I have no idea what I am going to do with it. It screams "teenage girl" to me, or worse, "teeny-bopper" - themes which I am trying not to use as I decorate my house. But I will confess, I still like it. I completed this quilt a little over a week ago but I could not blog about it in case the recipient happened to read my blog. I did mention the acquisition of the Joann's DS Quilts collection fabrics a few weeks ago but didn't go into too much detail about the intended project. This quilt was a present for our former treasurer, Shelly, to thank her for her work in the guild as well as organizing the retreat. I used nine DS prints and added three from my stash. I had always wanted to try making the New Wave pattern and I enjoyed the process. The only thing that was difficult was lining up the columns so that they would be flush with the pieces above and below them. The best way I can describe it: have you ever made bias binding? Do you know how you have to have a teeny triangle sticking out on both ends of the pieces so that it will line up right? That is what you have to do throughout this whole quilt and it is quite fussy. I backed it with one of my favorite prints from the DS collection - "Modern Floral" and bound it in the gingham stripe. I straight-lined quilted it with my walking foot and was pretty happy with how it turned out. Thanks to Monet for hand-binding it during our car-ride up to Kennebunk. Remember this quilt? I received a big shock when I learned that the designer of the whale fabrics, Anne Kelle, had noticed my quilt and had someone make her a "girl version." It felt really good that she had admired my work - even if I had used a pattern and my take on it wasn't exactly groundbreaking. It really made my day when I saw this picture posted on facebook recently: I gave this quilt to my friend Alane recently and it was awesome to see it being enjoyed. My friends and I have lamented recently that sometimes our handmade gifts to people go completely unacknowledged, or worse, they have even been rejected. Luckily I haven't had a really negative experience but I have felt awkward when I send something to someone who doesn't respond. When you ask if they received the gift, you feel weird because you feel like you are soliciting a "thank-you" - but you just have to know if the package, maybe, somehow got lost in the mail and you feel desperate enough to ask to see if they might at least say they liked it (when you already know they haven't acknowledged receiving it - let alone commenting on it)- it's just a weird situation. I recently received the most darling thank-you note from the daughter of a bee member who was thanking me for making the library block. It really made my day. Thank-you cards are definitely not necessary for participating in bee block swaps but i think it's wise that this young lady's mother is teaching her early, the importance of showing gratitude. In the end, I know I will always be making quilts and other handmade items for family and friends. I like the quote, "Never suppress a generous thought." This post might sound a bit too syrup-y but oh well - it's how I feel.